3D solutions for the creation of jewelry ring designs are ranging from CAD design to finished jewelry. Everyone recognizes the growing role of CAD technology in the creation and sale of jewelry designs. It is a ground for raising your business to the next level in the jewelry modeling industry. 3D modeling is a modern method of high-precision manufacture of jewelry models using three-dimensional graphics. 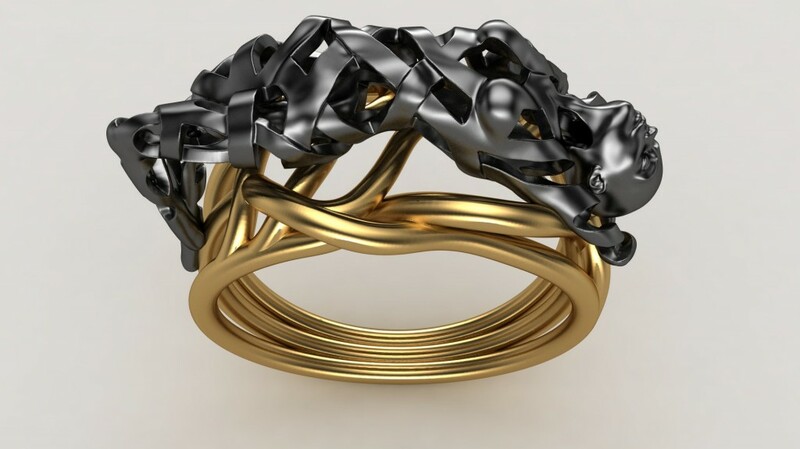 Still, 3D modeling is a great way to save time when designing your ring. The uniqueness of the computer ring model is a complete visualization of your ideas. It is a possibility to view it from any angle, size and the ability to make any adjustments to your discretion. Why go on standards and make a duplicate model when you can make a ring in its unique design and turn your own jewelry into a masterpiece! When modeling a ring it is important to set two different cutters that allow for processing inside the ring without loss of accuracy, and stability. To create a realistic image of gold rings on a decorative stand will need to use some not previously considered tools and techniques. However the simulation traditionally begins with the selection of the most appropriate base primitive. For example, as a basis for modeling the ring can take a standard geometric shape “Torus”. Since it is necessary to specify the torus with predetermined parameters, you can enter all the values ​​from the keyboard. We define a larger radius of the torus equal to 50, and the small equal to 2. In the real world we are surrounded by a huge number of simple and complex geometries forms. The objects of organic origin are the most difficult for 3D modeling. For example animals and plants are too difficult for 3D modeling as it not only takes time and experience but also a large margin of patience. Any such work requires training and knowledge that are acquired. Modeling ring designs is simpler. It is the modeling of simple objects, the shape of which the best meets our objectives. Modeling classical ring can be performed in various ways, starting with Surface, using the Lathe modifier (Rotation) and finally, polygonal modeling. And the more you will know the way to create the same model – the easier it will be a process of its creation. One of the drawbacks and benefits of both the three-dimensional graphics is it “perfectness.” Images created and costed in three-dimensional editor are excessively correct. In three-dimensional graphics the jewelry rendering process depends only on the conditions set by jewelry CAD designer. In order to achieve a more realistic, three-dimensional graphics the designer has to add to the scene the “accidents” himself. In other instances, through the three-dimensional graphics, on the contrary, it is required to emphasize the object ideality. This may be necessary, for example, to advertise any good. For example, flawless sparkling clocks started in 3D, of course, will raise the interest of potential buyers. The same goes for jewelry ring. Gold and jewels are always associated with brilliance, but in reality a piece of jewelry is not always possible to show beautifully. Gold jewelry may look different. The color depends on the metal, how polished gold. However, over time the metal surface is covered with numerous tiny scratches, and the product loses its former beauty. Having a handy three-dimensional jewelry modeling tools, you can create a perfect jewelry. While modeling wedding rings, do not forget to pay attention to the material, which the rings will have. If you are observant enough, you probably noticed that the products in jewelry stores usually lie on velvet material in black, blue or purple. It is not at all necessary that your material was velvet, but assigning the surface color is an advantageous set for gold jewelry. The ideal image of gold jewelry can be used in a variety of design projects. For example, rendered pile of coins can be used for the bank’s advertising, and the same wedding rings can decorate ad marriage agency.